Fat Burners. How do Fat Burners Work? 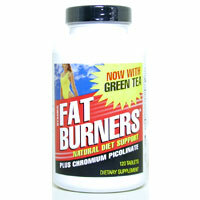 Thermogenics (fat burners), is the name given to a group of compounds that have the effect of speeding up metabolism. Thermogenesis, as the name suggests, means the production of heat within the body ['thermo': heat, 'genesis': the beginning]. Heat is a by-product of energy production. Therefore, if more fuel is burnt up by the body, more heat is generated. Some examples of thermogenics include certain foods, herbal extracts and fruit extracts. For example, capsaicin from chillis; caffeine from coffee, tea or guarana; and oxedrine from citrus aurantium. The most powerful fat burners are supplements that contain combinations of various thermogenic ingredients in concentrated forms. Fat burners are often used by people wanting to lose weight. They help to create an energy deficit by increasing the body's overall energy expenditure. Each day the human body burns energy. The total energy expended comes from three areas: the basal metabolic rate, any exercise performed and the energy used by the body in digesting food. If a fat burner is used it increases the energy expended in the basal metabolic rate and during exercise. If they then take a fat burner, particularly one that contains several powerful ingredients, their daily calorie expenditure may increase to 1800 calories. Of those calories, 71.33% may come from their basal metabolic rate (1284 calories), 20.34% may come from their daily exercise (366 calories) and 8.33% from digestion (150 calories). By increasing the calorie expenditure each day it becomes much easier to create a calorie deficit and therefore lose weight. So if our person in the example above, consumes 1500 calories from food during the day, without a thermogenic their body fat and weight will remain the same (calories in equals calories out). However, if they eat (and drink) the same amount of food but also take a fat burner, then they will have a calorie deficit that will need to come from their body's energy stores, resulting in a loss of body fat and weight. It is important to note that if their food intake is not controlled or they don't perform any exercise, then it is highly likely that using a fat burner would not be of benefit in helping them lose body fat or weight; they are not 'magic pills'. You can't expect to take a couple of capsules, then go home and eat pizza and drink alcohol and expect to get results. Thermogenics only work when their use is combined with a good nutrition and exercise program. They simply help you achieve your weight loss goal faster. Thermogenics are also used by people who simply want an energy boost. If you feel tired during the day or if you want a 'pick-me-up' before your exercise session, then thermogenics can certainly help. Thermogenic ingredients stimulate the nervous system helping to boost your energy and increase alertness. For best results thermogenics should be taken twice a day on an empty stomach at least 30 minutes prior to meals or before exercise and should not be taken after 4:00pm as they may interfere with sleep. Also, it is best to 'cycle' their use. This means use them continuously for a maximum of eight weeks and then have at least two weeks off. This prevents the body from becoming desensitised to the ingredients. There are several very effective thermogenic supplements on the market that can accelerate progress towards your goal. Those containing guarana and green tea extracts along with other powerful herbal extracts like coleus forskohlii and evodiamine are the most effective. They boost your metabolism and promote the use of fat for fuel in your body. It is also best to choose thermogenic supplements in capsule form rather than pill form because the ingredients are more readily absorbed. They may be used by most people but because they have a powerful effect on metabolism they are not for everyone. In particular, people with high blood pressure or who have heart problems should avoid their use. Also people under the age of 18 or over 65 should avoid them also. Furthermore, if you are considering using thermogenics, it is essential to see your doctor first and obtain their approval. If you have tried getting into shape in the past but haven't got the results and if you are willing to make some changes to your nutrition and exercise habits then thermogenics will certainly help.